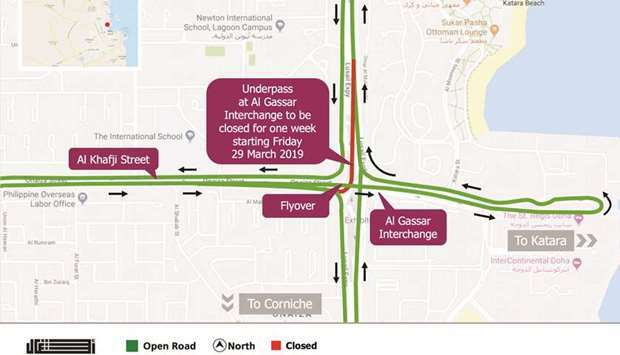 The Public Works Authority (Ashghal) has announced the temporary closure of an underpass at Al Gassar Interchange for road users coming from Al Khafji Street and heading towards The Pearl-Qatar and Lusail via Lusail Expressway. Designed in co-ordination with the General Directorate of Traffic, the closure will be implemented from Friday, March 29, for a period of one week to allow for maintenance works at the underpass, Ashghal said in a statement. During this period, road users coming from Al Khafji Street and heading towards Lusail or The Pearl-Qatar will be required to continue straight on the main flyover, make a U-turn at the end of Al Khafji Street and then use the first exit towards Lusail Expressway to reach their destinations, as shown on the attached map. The authority will install road signs advising motorists of the traffic change and requests all road users to abide by the speed limit, which remains at 80kmph along the route, and follow the road signs to ensure their safety.